That pretty much sums up my weekend. You can all go back to work now. But seriously? This weekend was awesome. Racing, spending time with my family, fake mustaches, riding my dad's tractor with him (and being way too big to sit on his lap...guess I'm not 9 anymore), and just spending time in the sunshine was the perfect remedy after being sick for 2 weeks and a little down about my marathon training. After the longest flight ever on Thursday night...it seriously took us 4 1/2 hours from take off to landing (Dallas is usually about a 2:45 flight)...and playing catch up with the family, I passed out pretty early on Thursday night. I may or may not have almost slid off of my sister's satin sheets, kicking her out of bed forcing her to sleep on the couch where she may or may not have seriously injured her collar bone...Oops. Friday: I woke up, spend the next 2 hours getting my 2 teenage sisters and one of their friends out of bed and we headed to the Expo to pick up our race packets for the weekend. The Expo wasn't anything too special, but it was well organized. 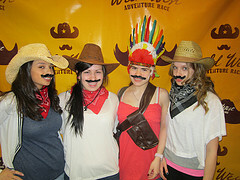 There was a booth for an adventure race that was doing photo shoots that me and the three teenagers I was with had way too much fun with. After the Expo, I went for a run with my not-so-little brother and spent the day resting up for the Cowtown 5k on Saturday morning. Saturday: Bright and early wake up call so my little sis and I could toe the line of the Cowtown 5k...her first race ever! It was pretty cold in the morning and I loved that the race organizer kept the Will Rogers Center (just a few feet from the start) open so we could stay inside to keep warm and use real bathrooms! Yes, I raced both a half and a 5k this weekend and never had to use a port-a-potty. Score! The course was pretty tough hill-wise but my sister pushed through despite not being able to really train because of a knee injury but she did awesome! We stuck together the whole time, sped up when she could and slowed down when she needed to and we crossed the finish together in 35:09! I'm so proud of her! Post Race, beer in hand! After vegging out post-race, we went on a fro yo date for some much needed sister time and headed back to the house to be lazy bums with the rest of my family. I have this horrible incapability of being able to nap after a race well, ever so by the end of the day, I was walking around like a zombie and ended up going to bed at 8:30 which was perfect for my 5am wake up call on Sunday. Sunday: Race Day #2! I felt really refreshed waking up because I went to bed so early the night before and after a yummy breakfast of half a bagel with PB and banana and a bowl of yogurt, it was off to the races! As I said last week, I had no idea what to expect going into this race. I was definitely trained for the distance but not any speed but boy am I glad that I have 8 weeks of hill training under my belt because I sure as hell needed it yesterday. I ran into my Madrid partner-in-crime at the start and chatted with her before making my way into Corral 2 for the start. Before the gun even went off, I regretted my decision to wear rights instead of shorts but it ended up not being too bad. Miles 1-3: As soon as I started the race, I knew it was going to be tough. My legs felt pretty tight and I was having a hard time running on the concrete. I had forgotten that Texas is all concrete and I hate running on concrete. There's no give! I knew it was going to be tough because of that but it was still early. The race wasn't crowded at all and I had my music on because in terms of spectators, it was on the quieter side. I was feeling pretty good and cruising around an 8:50 pace which is where I wanted to be early on in the race. I had plans of pushing that pace after the first 5 miles but that didn't happen. Miles 4-6: Mile 4 brought a pretty tough hill but nothing too serious in comparison with the Central Park hills. The worst part about the hills on this course was that from a distance they all looked absolutely massive because you saw them from the top of another hill and then descended before climbing again so mentally that was pretty tough. There were more spectators in this part of the course than in the first part which was fun, so I took my head phones out and just enjoyed the crowd and the scenery for a bit. My energy was starting to fade earlier than I expected so I took a Cliff Shot Gel. Mile 6 was my favorite part of this race. I grew up going to the Fort Worth Stockyards and it was so awesome to turn down Exchange and run down into the stockyards.The spectators in the Stockyards were great and despite the cobblestone streets being tough to run on, I loved running through this part of Fort Worth. Miles 7-10: Brutal. We basically run up Main Street and up...and up...and up for 2 1/2 miles. Up until this point, I thought a PR was within reach but by the time I got to the top of that hill into Sundance Square, I knew that my only shot at PRing this race was to PR the last 5k. I saw my family cheering me on right in Sundance with the awesome signs they made and that definitely gave me a boost to try and push the last 5k to a PR finish. My little sister and sister-in-law-to-be via The Fort Worth Star Telegram!!! Miles 10-12: More hills. The bridge at Mile 12 was nothing heartbreaking but it definitely shattered my hopes of a PR finish. At Mile 12, we started a pretty nasty down hill that is making my quads hate me today. I started losing energy pretty quickly and really wanted to take another Clif Shot Gel but I felt like I would expend more energy trying to reach around and get it out of my belt and that it probably wouldn't even kick in until after I had finished the race. That last mile was absolutely brutal though. It felt endless. It was the same finish as the 5k from the day before and I remember it feeling just as endless the day before. The Finish: When we finally hit Mile 13, the finish line still wasn't in site and I started sprinting to wherever the finish was. I didn't have much left in me but I gave it everything I had and crossed the Finish Line in 1:59:05. I crossed the Finish Line, grabbed my medal and headed inside to get my post-race goodies: food, Blue Bell ice cream, my Cowtown Challenge medal and my Finisher's shirt (which I wasn't expecting at all). All in all, I loved this race. Everything about this race was great: the organization, the course, the swag, everything! I walked out of this Race Weekend 1 t-shirt, 2 tech tees and 2 medals...how sweet is that? It wasn't a PR, but hey, I wasn't expecting one. I felt great and ran a smart race on a tough course. 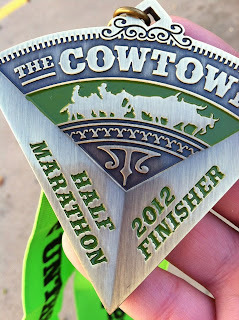 I loved everything about the Cowtown and will definitely be back next year! I'm back in New York and pretty exhausted after a long weekend away with long flights, early race starts and late arrivals but it was well worth it! awww, sounds fabulous!! great race on tired legs, my friend! YAY! So happy that you had such a great time! And that you and your sister ran a race together. I wonder if I ever could get my little sister to run a 5K with me... Congrats on your finish time! My dream is to break the 2 hour mark. I'm totally going to make a sign like that next time my boy runs a race! Nice work, Christy! I bet it felt awesome to pace your sister AND run the next day! That's amazing. Sounds like a fun race! You did amazing! Those hills sounded intense- I havent really ran hills since I ran a really hard race up a mountain a few years ago...but you ROCKED that race, even if it wasn't a PR, you still did great! I love that they gave you so many goodies too! Sounds like a great race!